This Shabbos I am giving a shiur at Seudah Shlishit at Etz Chaim. The title: Lot's Wife -- A Pillar of the Community. The content: This post on parshablog, about the name of the wife of Lot, and why and whether we should care. The food: I would guess challah, egg salad, tuna fish, pretzels and cake. Wolfish Musings attempts a debunking of 10 proofs moshiach is coming next year. For example, Iceland, composed mostly of ice, has begun to melt. An appeal in the Harry Potter Lexicon case. Madonna's conditions to Guy Richie to see his kids, at Life In Israel. Some seem new-age kabbalah-y, while some sound somewhat chareidi. You can explore a reconstructed Ancient Rome with a plugin for Google Earth. According to a study, organisms possess the mechanisms to control their own evolution. Remember that story that Sarah Palin thought Africa was a country? And that Paris Hilton's grandfather was angry over the advertisement "Celebrity"? I fell for them. But it turns out, as the New York Times reports, that they were the result of a hoaxter pretending to be a McCain staffer. BlogInDm continues his review of Rabbi Ephraim Luft's Torah Is Not Hefker. Here, he points out that Rabbi Luft misuses musical terminology and gets music history wrong, which in turn undermines his claim to being a music expert qualified to dictate kosher music. And further misinterprets a Malbim, who is merely saying that in historical times, the tupim were used for dances, towards his own end to declare that use for any other type of music is forbidden. In another post, he quotes Orthonomics about whether a certain bar mitzvah experience at a particular level should really be supported by tzedakah dollars, and defends it on the basis that the obligation is "dai mechsoro." Wheel of Time movies and games in development. New study, based on Israeli practice, suggests that early exposure to peanuts, rather than avoidance, is the key to suppressing peanut allergies. 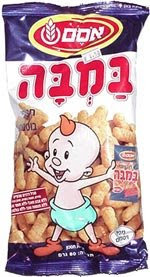 In large part, because in Israel, all the Israelis feed their children Bamba. I remember that many years ago, my mom was at an Israeli zoo, and despite a sign not to feed the animals, a woman was feeding the monkeys Bamba. My mom pointed out the sign, and suggesting that this junk food might not be good for the animals. The Israeli woman's reply: But it's Bamba! In the comment section of this parshablog post about whether Obama is a 'Dark Horse' Candidate for Gog, "yaak" of Yeranen Yaakov and I discuss whether Edom is still around (based on an earlier post about how Shadal understands the prophecies in Vayishlach), and if not, how one can interpret the prophecies in Ovadiah, and specifically the last pasuk, ועלו מושיעים בהר ציון לשפט את הר עשו והיתה לה' המלוכה. Actually, if it refers to the Chashmonean dynasty, then it is appropriate for Chanukka, which is coming up. I don't know if people in the states heard about the tragic story here- where materna, one of the formula companies didn't have enough of a vitamin (something like that, i don't know exactly what they were missing). Anyway, a number of babies died because they didn't get proper nutrition from the formula. Legend has it though, that one of the babies survived because the formula was supplemented with bamba! Izzy, yes, it might be true, because Bamba has vitamin b1. But the babies who had even one feeding of breastmilk also survived, for the same reason. I mean Remedia, not Materna. Who Or What Was Achuzat? Will That Be One Placenta Or Two? Chayei Sarah: Rashi and Women's Empowerment? Did Avimelech Touch Sarah, While Pharaoh Did Not? Is Obama A 'Dark-Horse' Candidate To Be Gog? No, Sarah Palin Is Not Jewish!